Jared McAlister works an an ice creation. For many local residents, New Year’s Eve is spent in downtown State College, admiring hundreds of ice sculptures, watching children enjoy the ice slide, and even getting a chance to witness ice carvers armed with chainsaws and blowtorches work on the large sculptures on South Allen Street. What visitors to First Night State College may not realize is that the majority of the sculptures are made by one man, Jared McAlister. McAlister has been carving ice for more than half of his life. He carved his first sculpture at the age of 14 in his grandfather’s icehouse; he now carves the majority of the sculptures created by the family company, DiMartino Ice of Jeannette. Though it took 14 years for the chainsaw to end up in his hands, he grew up with his grandfather’s business. For many years, he helped out where he could and was around ice carving almost constantly. Even so, McAlister didn’t always plan on being a professional ice carver. In fact, he opted for something quite different at first. But when the head ice carver at DiMartino Ice had to step down, McAlister was the man for the job. 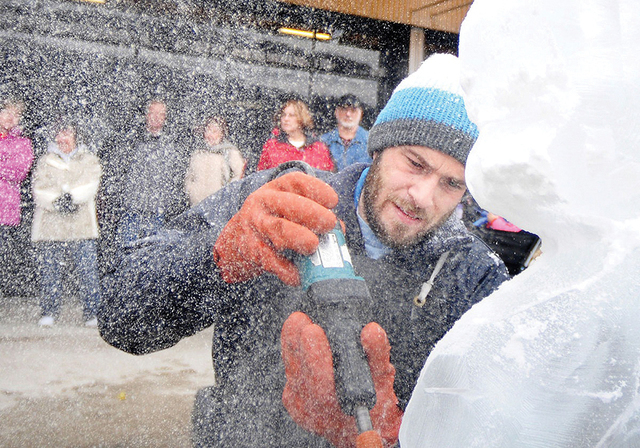 While it wasn’t his dream growing up, “I do have a passion for sculpting ice,” McAlister says. Nowadays, McAlister spends a lot of his time with a chainsaw in his hands. “On an average day in the wintertime when we’re getting ready for all of these festivals, First Night in particular, we’ll start the first week of October carving ice for four to six hours a day, roughly, six days a week,” he says. McAlister carves almost two sculptures a day. In 2017, the company made 512 sculptures in-house. DiMartino Ice was founded by McAlister’s grandfather Art DiMartino in 1968. Art wanted to start an ice company after retiring from the service, so he bought some used equipment and started making ice alongside his wife in their basement. As his sons – McAlister’s uncles – Ernie and Donald grew up, they started to help out here and there, including building a garage in the backyard. After his place of work moved and left him unemployed, Ernie started getting lessons from a neighbor, a chef who knew how to carve ice. “There weren’t that many standalone businesses for ice carving in the mid- to late ’80s,” McAlister says. “We live in western Pennsylvania where, in the winter time, there isn’t really a great demand for packaged ice. After a few years of entering ice-carving contests and traveling, Ernie started looking for somewhere that would host an ice festival. The first to bite was Ligonier, about 40 minutes away from the shop. The company has grown from there. DiMartino Ice now has been wowing people with live ice-carving events for more than 25 years. The hardest part of his art for McAlister is keeping the designs fresh and not re-doing the same things too often. Coming up with new designs for live performances takes time. Once it is time to carve the ice, the carver starts by taking off big chunks and roughly shapes the sculpture with the chainsaw. “We always say you do about 80 to 85 percent of the work with the chainsaw, because it’s your fastest tool,” McAlister says. Once the rough outline is complete, McAlister moves to smaller tools. These include a disc sander and other more precise tools. After purchasing an old service station in Jeannette in the late 1980s, the company retrofitted it into an icehouse, complete with a large freezer and a machine used to make 300-pound crystal-clear ice blocks. Each year, the company uses about 1,500 of those blocks. Ice carving is a very physical art form. This year, McAlister’s cousin, Joe DiMartino, graduated from the apprenticeship program and is able to help him here and there to take some of the load off. Between the start of October and First Night, McAlister will carve about 90 sculptures that will be on display around downtown State College. On the way to set up for First Night, the company will bring another 120 blocks of ice to carve the big sculptures on South Allen and the ice slide at Sidney Friedman Park. All in all, that accounts for around 210 blocks of ice – nearly 63,000 pounds – ahead of any carving. Several sculptors, including other family members, travel with McAlister to help set up and carve on First Night, supervised by their captain – or as McAlister knows him, Uncle Ernie. In the shop, McAlister uses hot water from a hose to reveal a crystal-clear sculpture he has created. Outside in downtown State College on New Year’s Eve, with no access to warm water, he gets creative and uses a spectator favorite. Though McAlister has been helping with the family business at First Night for most of his life, it was a while before he got to start carving. He started by helping his grandfather unload blocks that would be delivered around town. When he first began carving at First Night, he was allowed to round off something here and add detail there, using the smaller tools. Tommy Butler is a freelance writer in State College.